Friends of Science Society says much of the global push for “climate action” comes from the ClimateWorks Foundation billionaires who are pushing a global cap and trade system along with their vested interests in renewables. According to a Wikileaks document they have spent some $600 million a year for over a decade, funding influential Environmental Nongovernmental Organizations (ENGOs), as confirmed by a 2018 research paper by Matthew Nisbet published in Wiley Climate Change. Canadian investigative researcher and author, Donna Laframboise, revealed in her 2011 book “The Delinquent Teenager…” that the IPCC reports were unduly influenced by ENGOs Greenpeace and WWF. In the Summer 2018 edition of “Issues in Science and Technology,” Roger Pielke, Jr. wrote a compelling review of the IPCC’s push for “Goldilocks” solutions like BioEnergy with Carbon Capture and Storage (BECCS) which he says have jumped from a notion to a central part of mitigation recommendations, with no critical or cost-benefit analysis. BECCS is a theory for “negative emissions” using large scale plant growth to absorb CO2; the crops are burned to create energy while the CO2 is captured and buried in the ground. There are no such large-scale BECCS operations today. Pielke also notes the IPCC tends to rely on academic papers using the highest estimates for warming (Representative Concentration Pathway – RCP 8.5) with little reference to the more realistic low end RCP2.6. The IPCC report pushes wind and solar as solutions to global warming, but two recent studies have found they increase temperatures, one reported by The Harvard Gazette, Oct. 4, 2018. Another paper in DES Tech Transactions on Computer Science and Engineering PCMM conference 2018 shows that “Carbonless Anthropogenic Global Warming” is caused by wind and solar. The actual global warming trend over the last 40 years is less than half (47%) of the climate models’ simulation on which the UN IPCC report is based, and half of the actual warming is due to natural ocean cycles. Friends of Science Society says carbon dioxide is not the control knob that can control climate. The IPCC is fraught with conflicts of interest. Official reports filled with Goldilocks thinking but without cost-benefit analysis or practical plans are useless. The alleged climate catastrophe claims are damaging to people’s psyche, especially that of children. The UK Met office ‘Decadal’ five year forecast is out. Using a reference period now of 1850-1900, pre industrial times as advocated in SR15 to enforce the claim that temperatures have risen by 1C during the industrial period. Perhaps the new ‘normal’ temperature is a period at the end of the little ice age. Oh how we miss those heady Victorian days… we were much better off then…. And no guarantee that such ridiculous levels of spending would have any effect at all on the climate, which is claimed to be the point. The whole thing is absurd beyond belief. Yet that hasn’t stopped the shameless production of ever more ludicrous inconsistencies, contradictions and lacunae. Today the IPCC has issued yet another prediction of climate apocalypse, giving us 12 years to limit the catastrophe of climate change. The climate alarmists need to be reminded of some of the basics of their theory. Global warming is allegedly driven by global GHG emissions raising the atmospheric level of various well-mixed greenhouse gases. It follows to cut global emissions to zero, (and that is by 2040 to stop 1.5C of warming according to this report – see SPM Page 6 chart b) any policy initiatives must be global, whether a carbon tax or cap and trade. Such policy is decided (generally) at country level, unless it is the EU. The Paris Climate Agreement excludes developing countries from any obligation to cut their emissions. These developing countries likely account for 80% of the global population, 65% of emissions and around 100% of the net increase in emissions since 1990. The other policy implication with meeting this 1.5C target will be that around 80% of the known reserves of fossil fuels will have to be left in the ground. For the so-called 1.5C target it is about 600 GtCO2 units. 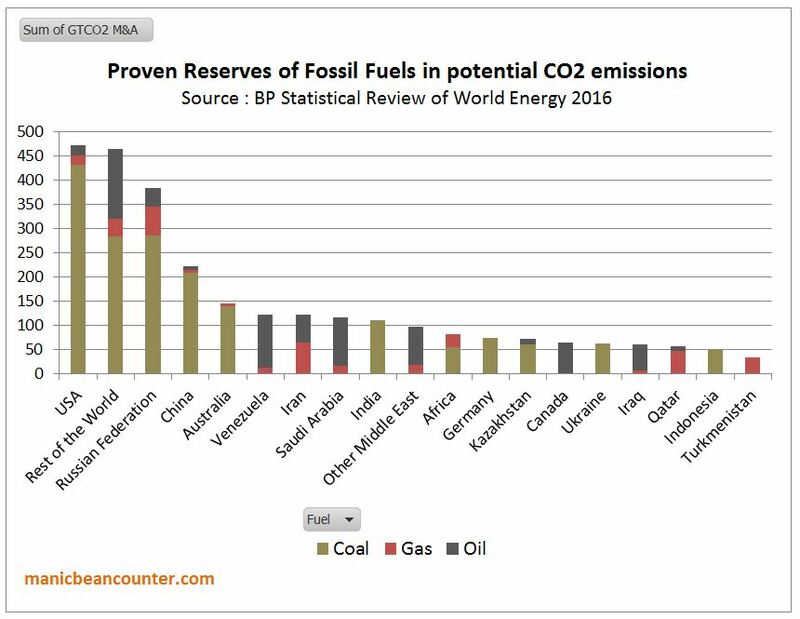 Below are the countries where the major fossil fuel reserves are located, with reserves expressed in potential emissions. Why should countries who rely on oil and gas exports for a large part of their national income (Russia, gulf states, Turkmenistan etc.) support a policy that would wreck their economies in a generation, particularly when the vast majority of their customers are not reducing their emissions? The fanatics don’t really care about the cost. They are obsessed and becoming less rational by the day. The only thing that matters to them is to silence critics. The UK is taking a tentative step towards a radical “green” future with zero emissions of greenhouse gases. The government is formally seeking Committee on Climate Change guidance about how and when to make this leap. 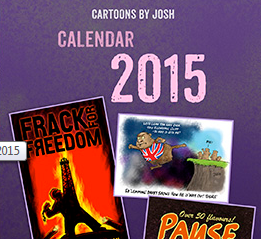 If it happens it would mark an extraordinary transformation of an economy built on burning fossil fuels. The decision was prompted by last week’s UN report warning that CO2 emissions must be stopped completely to avoid dangerous climate disruption.